Anne Marie Provencal (left) of Skowhegan has served as the goalie for the Husson University field hockey team that has advanced to the second round of the NCAA Division III tournament. 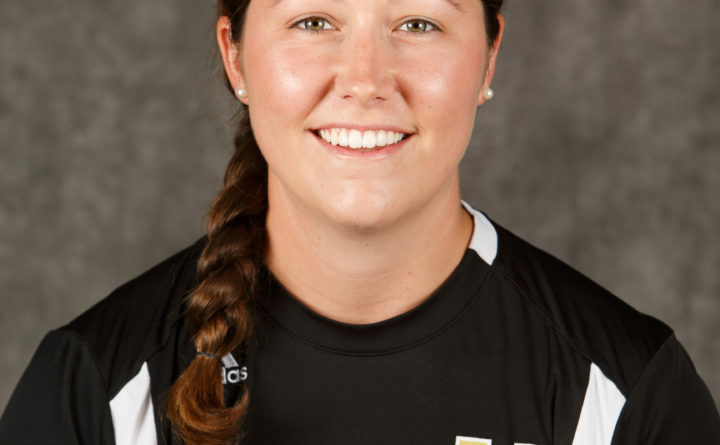 She began her collegiate career as an ice hockey goaltender at the University of Southern Maine in Gorham. BANGOR, Maine — Skowhegan’s Anne Marie Provencal is putting together a memorable end to an outstanding career. 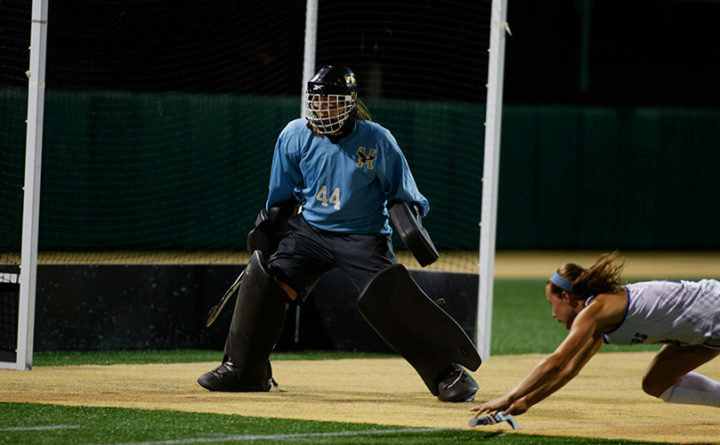 The goalkeeper for the Husson University field hockey team made 11 saves on Wednesday to lead the Eagles to their first ever NCAA Division III tournament victory, a 1-0 triumph over fifth-ranked Babson College at Wellesley, Massachusetts. It also gave the Eagles a school-record 13 wins as they advance to play the University of Rochester (17-3) on Saturday at 2 p.m. at Middlebury College in Vermont. Provencal was named the North Atlantic Conference Defensive Player of the Year and also earned Northeast Athletic Conference/North Atlantic Conference tourney Most Valuable Player Award recognition. She was an All-NAC, first-team choice. She has played two sports in college and at two different schools. Provencal, who backstopped Skowhegan High to three straight Class A field hockey state championships with three title-game shutouts, was also a defenseman on the boys hockey team. She played two years of softball and was on a state championship softball team. She went on to play 1 1/2 seasons of ice hockey for the women’s team at the University of Southern Maine in Gorham before transferring to Husson. She had two assists in 30 games. Provencal serves as a co-captain with her former Skowhegan field hockey teammate Mikayla Toth, who scored the goal that beat Babson. “It has been a joy to play with her,” said Toth. “My high school coach (Paula Doughty) said her best athletes were always her goalies. “She’s very quick and agile. She has good hand-eye coordination. She knows when to go down, when to step up and when to come out. She’s really smart on the field,” said Toth. She also said Provencal has an “uplifting” attitude. First-year coach Sabrina (Vaillancourt) Smith said she is honored to have a goalkeeper like Provencal. Provencal enjoyed her time at USM but said Husson “is like home. I love Husson. “I like the campus and I like my major (occupational therapy). Field hockey was another factor (in the decision to transfer),” said Provencal. She has been happy with her season. Provencal takes a 2.19 goals-against average and a .810 save percentage into the Rochester game. Husson’s leading scorers are Saco senior Lauren Russell (12 goals, 7 assists), sophomore Sadie Royer of Greene (12 & 6), senior Taylor Shaw of Plymouth (14 & 0), Toth (6 & 4) and Dover-Foxcroft freshman Alli Bourget (5 & 3). The Eagles face a Rochester team that has a 20-goal scorer in Claire Dickerson and a nine-goal scorer in Nancy Bansbach.